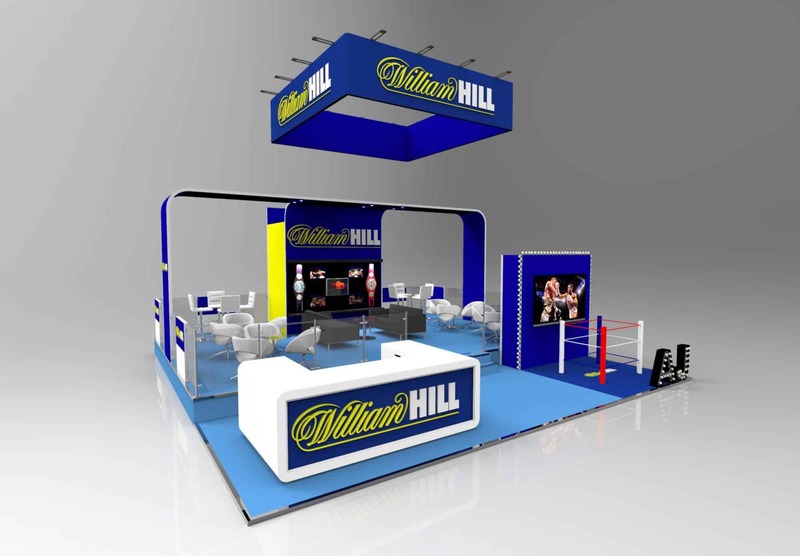 William Hill is a long standing and much loved Symbiosis client. In 2019 we were asked to refresh its existing and very successful exhibition stand design for the iGB Affiliate events. Launching at the London Affiliate Conference 2019, the booth needed to incorporate William Hill’s sponsorship of sponsors of IBF World Heavyweight Champion Anthony Joshua’s (MBE) while maintaining the all important business meeting focus. Working closely with William Hill and its virtual reality agency Saavy, we created a design with two distinct zones: a large front of house networking bar with a Anthony Joshua VR fight games area with 60″ LED screen and boxing ropes, posts & lighting. To the rear a spacious invitation-only lounge spanned by an imposing yet elegant branded archway. A wall of memorabilia concealed a handy storage room and branded glass balustrade kept everything light, airy and distinctly businesslike. The new design was a great success. The two areas worked a treat with the front of house busy and buzzy through the show. While the open plan lounge remain calm even under the pressure of back-to-back meetings. 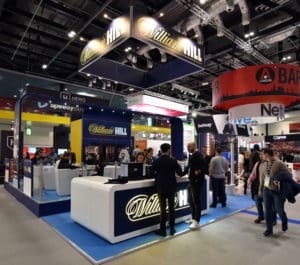 As usual we took care all the finishing touches, from supplying experienced bar staff, keeping the fridge loaded with drinks even delivering extra merchandise leaving the William Hill team relaxed and able to enjoy the show. Did you find the ideas in the ‘William Hill at LAC 2019‘ case study interesting?